Cascading Style Sheets can be used to create remarkably reliable Web animations. Learn to use pseudo-classes to create basic web page animations by hiding, showing, and modifying CSS blocks and attributes. These basic interactivity features are essential for creating the user interaction and navigation that visitors to your web pages expect. This class does not cover the advanced interactivity features that were introduced with HTLM5 and CSS3. 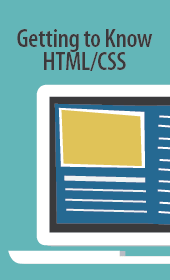 For animated HTML5 widgets see our "Rich Media with Edge Animate" class.